I bask in delicious rays, my skin absorbing the heat others escape. 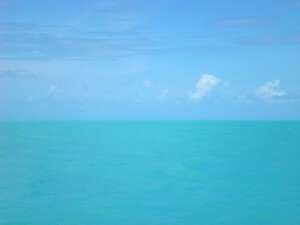 Before me lies the turquoise sea meeting the cerulean sky at a point in the horizon where they become a blurry line. Beneath me, the coarse sand of Jamaica’s coastline where I pluck pieces of discernible rock and shell. Behind me are shacks and stalls. Women sit swatting flies and mosquitoes until they hear the crunch of a footstep on their gravel pathway. Their heads wrapped in worn scarves; their emaciated bodies carrying the burden of ragged clothing. For now, poverty and wealth tenuously exist side by side. K.A. Sital is a Trinidadian writer whose goal is to traverse and capture the Caribbean. Her poetry and prose have been published throughout the West Indies.